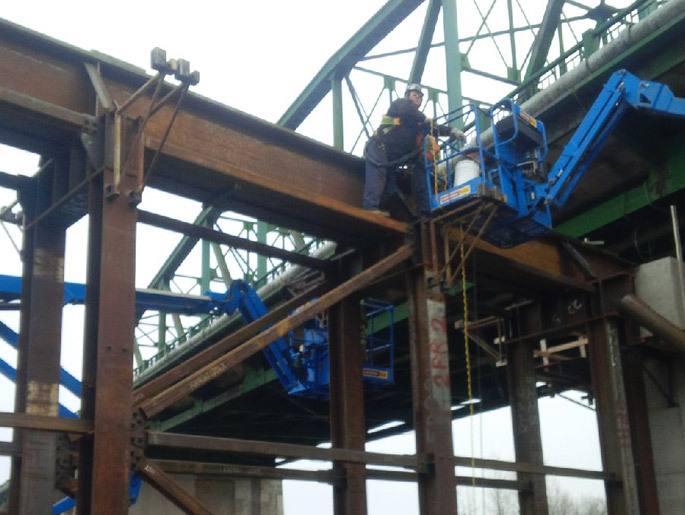 The central avenue replacement bridge will replace an existing 5 span bridge structure. The existing bridge longest span is a through truss design that spans 61.56m over 4 railroad tracks. 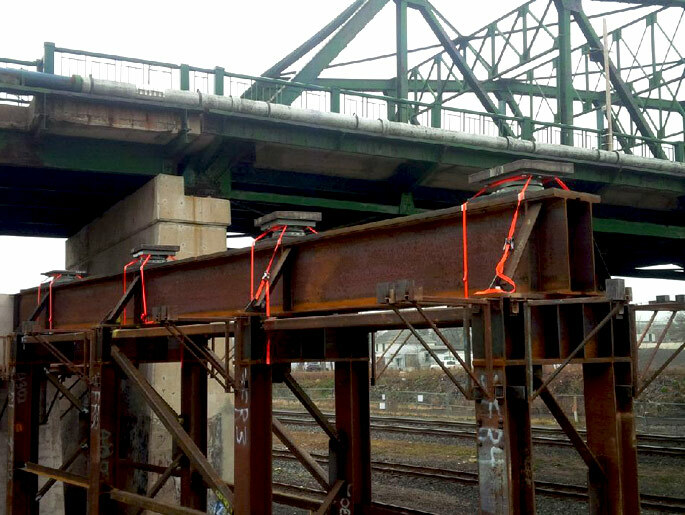 Due to the location of existing adjacent properties, the new bridge was designed to be located in the same footprint as the existing bridge (with longitudinally offset foundations so that the new foundations can be constructed beneath the existing bridge while it was still in service). The new bridge is a 3 span continuous (35m, 46.5m, 33.2m), variable depth, plate girder bridge with composite 250mm thick concrete deck skewed at 12 degrees and supported on shallow reinforced concrete abutments and piers complete with spread footings founded on bedrock. The 250mm thick concrete deck has a total width of 14.4m and was designed to support 2 – 3.5m traffic lanes, 2 – 1.5m wide bike lanes and 2 – 1.8m wide raised concrete sidewalks. The center span of the new bridge spans over 4 existing railroad tracks. 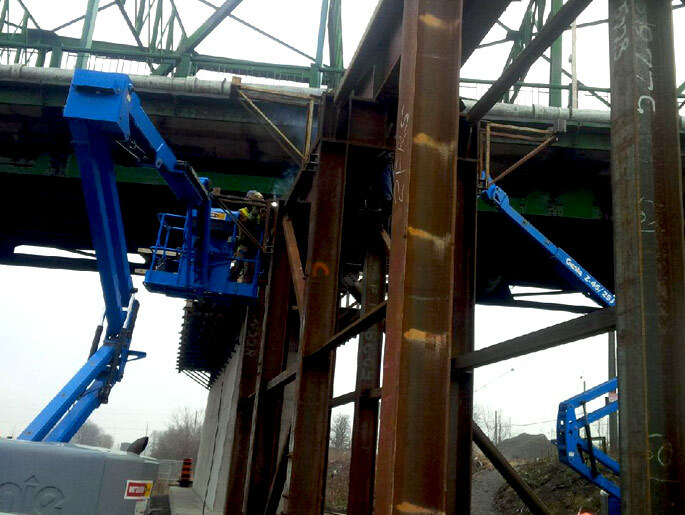 Due to the importance of the existing thoroughfare, an accelerated bridge construction scheme that includes constructing the new bridge superstructure on temporary bents adjacent to the existing bridge structure and then transversely launching the bridge into its final position during a full road closure was the option selected by the bridge owners (Regional Municipality of Niagara). The total transverse launch distance from the superstructure temporary location into final position was 14.63m. HEC was responsible for the structural design of the 4 – self stabilizing temporary steel bents which were supported on spread reinforced concrete footings founded on bedrock. The bents were designed to support the entire superstructure dead loads (i.e. 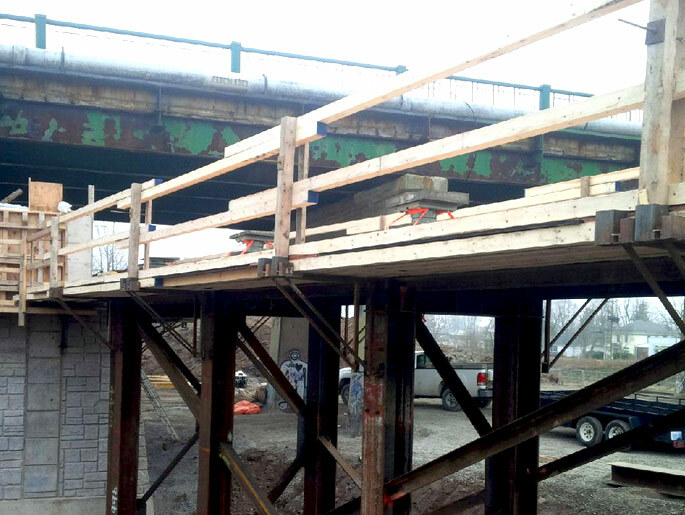 steel girders, concrete deck, concrete sidewalks, concrete barriers, steel railings), along with construction wind loads and thermal movements.